Professor Layton is back and his latest adventure is just as odd and charming as ever. Layton and his apprentice Luke are thrust 10 years into the future, and in the future random people are still ready to solve all problems — not through violence or debate, but through puzzle solving. The plot is just as quirky as ever and, as with the previous games, becomes absolutely ridiculous at the end. However, in The Unwound Future, the plot becomes more ridiculous earlier, with moments such as the professor building a gun out of slot machine parts and fending off the mafia by shooting them with coins. Older characters are introduced somewhat haphazardly and some plot points feel rather forced. However, there is a welcome amount of character development in this game as we find out more about Layton's past as well as Luke’s. I have no idea how they keep coming up with puzzles for the Professor Layton games. 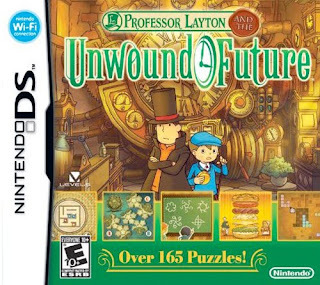 I would think that they would have to start repeating themselves more, but Professor Layton and the Unwound Future has an even greater puzzle variety than the previous games. So when the waitress asks you to solve a stacking puzzle before she gets you your drink, you don't have to worry about seeing the same puzzle but with more objects when you talk to her again later; you end up with a slider puzzle or a visual puzzle instead. While I do miss having increasingly complex variations on a single puzzle idea, the variety more than makes up for that. This also eliminates the problem of simply being bad at a certain puzzle and getting stuck as it shows up more and more often. There are, of course, the slider puzzles and mathematical tricks, but they tend to have a little twist on them that makes them feel new, such as having to solve a slider puzzle in a certain number of moves. To facilitate these sometimes more complex puzzles, the memo system has been redone so that you can use different brush sizes and colors on your memo overlay. Especially welcome is the addition of an eraser brush — no more clearing all of your written notes because you made one mistake. Another welcome addition is the Super Hint, which all but solves the riddle for you. It is available after you use up the other three hints and costs an additional two hit coins. So on those puzzles that you just cannot seem to solve, you now have a way out. While the plot does feel contrived at times, the puzzles and just plain quirky fun of the character interactions more than make up for it. The addition of more animated, fully voiced cutscenes also adds to the experience and never failed to put a smile on my face. The game is great fun and I look forward to the next Layton game.